Vascular endothelial growth factor receptor-2 (VEGFR-2) is one of the regulatory elements of angiogenesis that is expressed highly in various diseases and is also essential for solid tumor growth. The present study was aimed at identifying potent inhibitors of VEGFR-2 by considering herbal secondary metabolites; as natural molecules are less toxic than synthetic derivatives. 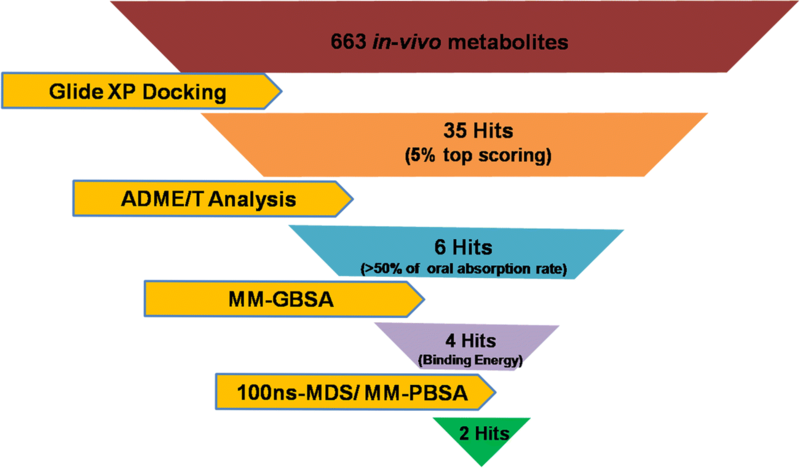 A structure-based virtual screening protocol consisting of molecular docking, MM-GBSA and ADME/T analysis was initially used to screen a library of in vivo metabolites of the herbal ingredient. Using a fixed cutoff value, four potent virtual hits were identified from molecular docking, ADME/T and binding affinity calculations, which were considered further for molecular dynamics (MD) simulation to broadly describe the binding mechanisms to VEGFR-2. The results suggested that these molecules have high affinity for the catalytic region of VEGFR-2, and form strong hydrophobic and polar interactions with the amino acids involved in the binding site of ATP and linker regions of the catalytic site. Subsequently, the stability of the docked complexes and binding mechanisms were evaluated by MD simulations, and the energy of binding was calculated through MM-PBSA analysis. The results uncovered two virtual hits, designated ZINC14762520 and ZINC36470466, as VEGFR-2 inhibitors, and suggested that they bind to kinase domain in an ATP-competitive manner. These virtual hits will offer a suitable starting point for the further design of their various analogs, allowing a rational search for more effective inhibitors in the future. The online version of this article ( https://doi.org/10.1007/s00894-019-3979-6) contains supplementary material, which is available to authorized users. We thank Dr. Elmar Krieger, YASARA Biosciences GmbH, for providing an academic version of YASARA dynamics software. 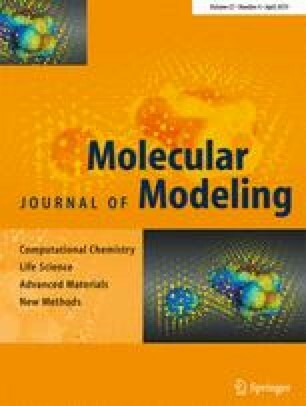 The authors acknowledge Prof. Gert Vriend (WHAT IF Foundation / CMBI, Netherlands) for his critical suggestions in Protein Dynamics Simulations. The authors are grateful to the Bangladesh Council of Scientific and Industrial Research for funding under the R&D project (SL. No. 42, 2016-17) to build a computational platform in Bangladesh. R. D., S.M., S.M.Z.H. and M. A. planned experiments, analyzed data and prepared manuscript. R.D. S.M. and M. J performed experiments, and prepared the figures. All authors reviewed the manuscript.